Story of Russia's early space exploration comes to Science Museum. An unprecedented display of Soviet space artefacts is due to open at a Science Museum exhibition in London in September. Cosmonauts: Birth of the Space Age tells the story of the early years of Soviet space exploration through 150 priceless artefacts, most of which have never before been out of Russia. Alexei Leonov, the legendary Russian cosmonaut, was invited specially to London to announce the exhibition and talk about his own remarkable achievements. But first Ian Blatchford, the Science Museum's director, apologized to guests for an unexpected delay at the event, May 21. London space history fans have grown accustomed to delays over the past year. The exhibition, hailed as the highlight of the Year of Russian Culture in the UK, was scheduled to open last autumn but then repeatedly postponed. It now coincides with one of the key anniversaries celebrated in the exhibition, the fifty years since man first entered space. What has become a routine, although risky procedure for cosmonauts today, back in 1965 nearly cost Leonov his life. Standing by an old-fashioned school blackboard in front of a packed auditorium, the veteran Soviet cosmonaut gave a gripping account of his epic 12-minute spacewalk. The famous event, on March 18, 1965, was the first ever spacewalk. Half a century later the thrilling experience still has the power to inspire: Hollywood space thriller Gravity hit the screens in 2013, and a more realistic depiction of what it means to move around outside a space capsule will be seen next year in Timur Bekmambetov's First Time. The reality of Leonov's space walk was even more dramatic than even Hollywood's top talent can imagine. Cosmonaut Leonov and his crewmate Pavel Belyayev could not have been prepared for what they encountered on that day half a century ago. Minutes after he left his spacecraft, Leonov realized his suit had blown up like a balloon, preventing him from getting back into the airlock. He had to choose between being stranded in space or bleeding out the air and risk dying from decompression sickness. Later on, both cosmonauts narrowly escaped death in a fire when oxygen levels soared inside their Voskhod (Sunrise) 2 spacecraft. On the way back to Earth, the navigation system failed forcing the crew to land hundreds of miles off target in the Ural Mountains. Leonov jokes about his mission’s grave mishaps, comparing them to minor mishaps during training. “Pasha jumped out and ended up in snow, about 1.5 meters deep. I followed him and also fell through. Now imagine this: a space ship in the middle of taiga and next to it two heads sticking out from the snow," he joked. The audience laughed obligingly before he added that it was only after two nights in freezing temperatures were they rescued. For many years, all of this remained top secret. After Leonov's pioneering spacewalk, the mission was immediately hailed a success, helping put further pressure on the relentless space race with the USA that was feverishly working towards the lunar landing of 1969. In 1968, Leonov was selected as commander of a mission to circumnavigate above the lunar surface in a Soyuz spacecraft and was chosen to be the first Soviet astronaut to make a moon landing. However, both flights were cancelled because the United States had already won the race to put a man on the moon when Neil Armstrong landed on the lunar surface making his famous "one small step for man, one giant leap for mankind." Leonov went into space again in 1975 as part of the joint Soyuz-Apollo mission. It effectively ended the rivalry of the space race and signalled the beginning of international cooperation in space research and exploration. This cooperation ultimately led Helen Sharman or ‘Lenochka’, as Leonov affectionately calls her, to become the first British astronaut to take part in a Russian space station mission. Sharman admits her experience in 1991 was a huge challenge. 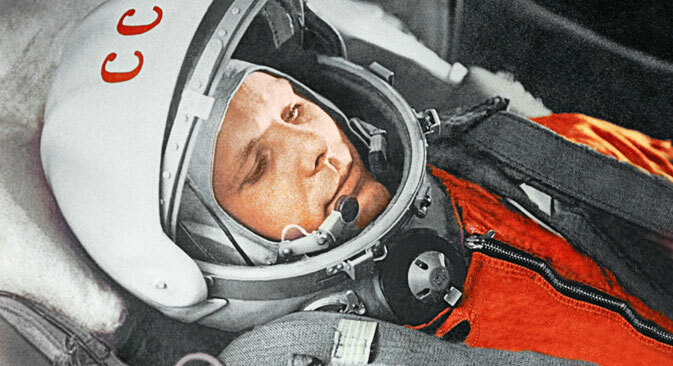 “I wanted to be part of the training, because I knew I was going to live in the Soviet Union, I was going to learn to speak Russian, live with all the other cosmonauts and learn so much from them. To be honest, it was for the training that I went as much as for the actual space flight. I gave up my whole life. I gave up my job, my car, my flat – basically everything, but it was worth it,” she says. Tickets for the ‘Cosmonauts’ are already on sale. The exhibition runs 18 September 2015 to 20 March 2016.